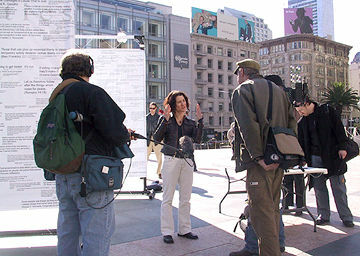 Creation of Dialogue and the national tour was covered by award winning documentary crews. The final film covers the cross country adventure, event installations and reactions from the audience. 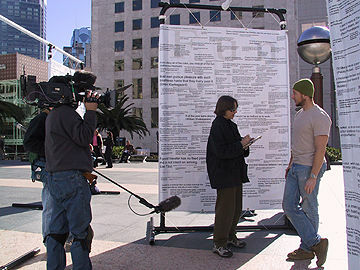 While exploring freedom of expression, the creative process and the healing potential of innate wisdom, the Dialogue community installation and its crew travel across the United States, visiting over 9 diverse cities, including: Chicago, San Francisco, DC, Denver, Santa Fe and New York. Unfolding like a narrative drama, Dialogue demonstrates how profoundly the un- expected can inspire, how our public spaces are being co-opted and, in moving interview footage, how the wisdom of the ages revitalizes lives­all against the back-drop of America's ever-changing landscape. "The bold story of an inspiring community art project and its compelling journey across the United States ..."
"... a provocative, revealing and meditative glimpse into the creative process and America's social landscape." Thank you to the Palos Verdes Library District for hosting a popular documentary screening in July at their new library center in Palos Verdes, CA. We also had an amazing screening in one of the towns featured in the documentary, Warren, OH in their beautiful outdoor amphitheater. Upcoming screening include San Francisco, Eureka, Redondo Beach and more! We had an amazing time at the Garden State Film Festival in New Jersey. The documentary won an award for being the best overall documentary where "... music, story and art all come together in harmony." We are honored by the award and met many wonderful people during our stay April 4th to the 8th, 2008. Special thanks to Diane Raver, Festival Director, for her warm and generous hospitality. Here are some photos of our trip!